Purchase an All Access Pass for the best value and gain access to all of the content on the ABS Live Learning Center. Choose either a 1 Year or 6 month pass. 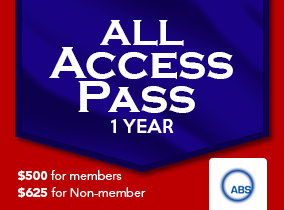 Purchase the All Access Pass and extend your education with exclusive access to all recorded live ABS events. 1 year subscriptions begin at $500 for Members. 6 month subscriptions begin at $350 for Members.